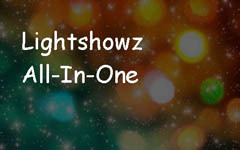 Includes Lightshowz All-In-One with 36 DC channels plus 5 showz of your choice! Power supply is extra depending on your requirements! Includes Lightshowz All-In-One with 9 RGB channels plus 5 showz of your choice! Power supply is extra depending on your requirements! Includes Lightshowz All-In-One with Pixel controller plus 5 showz of your choice! Power supply is extra depending on your requirements! To purchse your Lightshowz Packages please Choose from the dropdown menu below. We’ve taken two popular products, our R2R Player and an R2R Controller, combined them in a package and named it Lightshowz All-In-One. Step back and watch the magic, it doesn't get any easier than this! 1. Our Lightshowz All-In-One DC package comes with a Ready2Run Player including 5 pre-loaded showz of your choice on a memory stick,36 DC channels + DMX Dongle + Cat5 10m cable. This complete package is ready to run all you need to do is pug it in! 2. Our Lightshowz All-In-One RGB package comes with a Ready2Run Player including 5 pre-loaded showz of your choice on a memory stick,9 RGB channels + DMX Dongle + Cat5 10m cable. This complete package is ready to run all you need to do is pug it in! 3. Our Lightshowz All-In-One Pixel package comes with a Ready2Run Player including 5 pre-loaded showz of your choice on amemory stick, pixel controller + Cat5 10m cable. This complete package is ready to run all you need to do is pug it in!